The objective of this project is to develop a method by which managers of large animal feeding operations can increase their herd size by increasing the efficiency of manure management while operating within acceptable environmental tolerances. 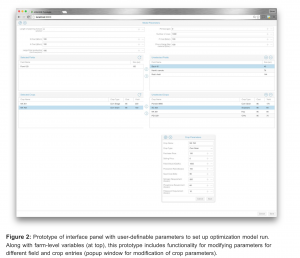 To achieve this, we have developed a farmscale mathematical optimization model to aid farmer decisions on crop/rotation planning and nutrient application. This model is designed to minimize annual operational cost while respecting environmental constraints on phosphorus and soil loss. These key regulatory environmental constraints (e.g., PI and Soil loss) are enforced by interfacing with SNAP+ data.The model provides a detailed prescription of field level crop rotations along with manure and fertilizer application rates. This model is then extended to evaluate the impacts of manure separation techniques in the long term or potentially recommend new separation technologies. We find that separation provides yearly benefit in nutrient management and enables increase in herd size. In order to make this technology accessible to a broader audience, we are developing a webbased application where farmers or managers can upload and access their own data to populate the models, which can then be run to produce prescriptions for their own farms that optimize the efficiency of onsite manure management, reducing the cost of manure disposal. Integrating separator technology allows the model to further refine the prescriptions with more precision, allowing the farmer to further increase utilization by providing suggestions on where to strategically apply different separator products, and maximize income by selling off others. In the future we plan to integrate the model prescriptions with variable rate application technology to increase the precision and efficiency of onfarm utilization. 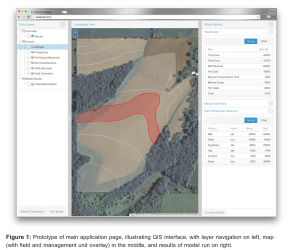 The idea is to have a web based interface with a GIS style interface that allows access to farm, field, and crop level information management, along with the ability to customize, run, store, and recall optimization runs for comparison. Below are some screenshots of an initial prototype please note that these are meant as a proof of concept, and may differ significantly from the final product. For additional information, please contact Steven Wangen at srwangen@wisc.edu.